Billions and billions. It’s an appropriate phrase when used to describe the number of neurons in your brain, one of the most complex systems humans have encountered. Sporting approximately 86 billion neurons, the number of connections between cells in the brain easily goes into the trillions. Of course, this is nothing new, and we are used to thinking about the brain in this way. But it turns out that this is not the only insanely complex network found in our bodies. There is one buried in our bones. A mature bone consists of a hard external layer and spongy internal structure, shaped out of the same kind of mineralised tissue. However, bones are more dynamic than you would think. The surface is constantly being broken down by cells called osteoclasts, and recreated by other cells – osteoblasts. Watch the video below to get a glimpse of this process in a stunning visualisation. 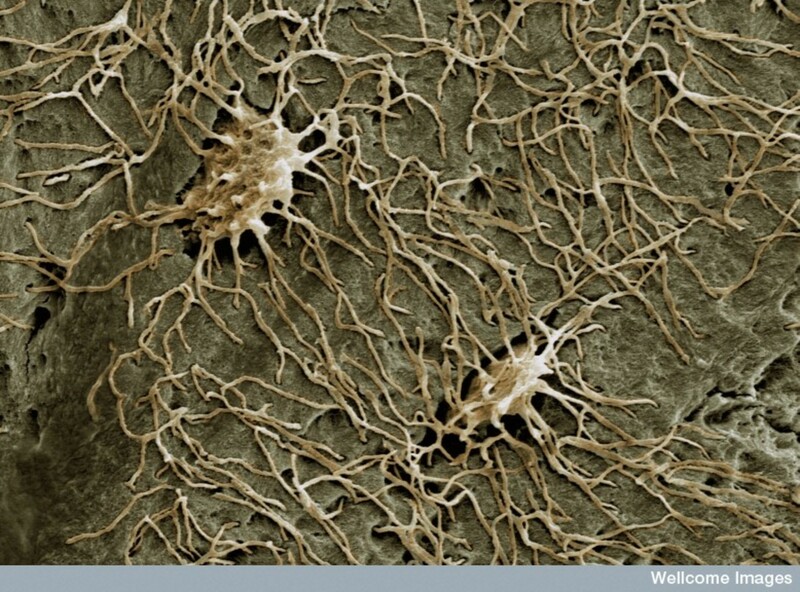 When an osteoblast cell gets embedded into the hard mineral material, it changes into an osteocyte – a star-shaped cell which branches out with long dendritic fingers to connect with others of its kind, forming a living cellular network throughout the skeleton. It is a useful network, too – osteocytes exchange information to sense how strong a bone needs to be; they also help with the aforementioned bone tissue regeneration process, and are implicated in other cellular processes, such as calcium release in the blood. Not only are osteocytes numerous, they also form an astonishing amount of connections, much like neurons. Indeed, the network is a lot like the brain – “a similar number of cells interconnected in a similar sized space,” according to Natalie Sims, co-author of the study published in the journal Bone.